You don't travel without good reason, equally you shouldn't create marketing materials (website, flyer etc) without purpose, objectives, goals. You rarely travel without having a destination in mind. Your Clients are your destination, profile 'what they look like' and 'where they are' in order to find them. Packing and preparing for your passenger helps ensure all's well during your journey and also when you arrive. (eg.Ensure your content helps your pre-identified visitor & their problems). Some potential passengers are waiting at bus-stop's or calling for taxi's - anticipating 'your route to collecting passengers' is key. (eg.Web Content for Google, Twitter, Facebook etc). PROBLEM: What can or should you expect from your website? PROBLEM: Your website needs to get found by the right people/prospects + get found lots + turn a % of those visitors into an enquiry or sale. PROBLEM: You've a website and need more web visitors, or, need to improve your type of web visitors - But your web options are overwhelming, from Social networking to SEO and e-mail marketing. At its most basic, a Webpage is a 24/7 flyer. However, at it's best ... it's a business and income in itself. Draft a word doc on what you'd like your site to do for you, or, phone us for free advice! 'Content that solves' your searchers problems. Draft a word doc, or, phone us for free advice!. Note monetary keywords & phrases (identified in Step 2) by offering. Draft your content into our free Page Planner Document. ​Draft a word doc to simply begin your process of drafting what sections you might need and content so such. GUIDE ANSWER: The wrong Web Marketing will waste your time & effort. eg. If you need to get in front of business owners and/or decision makers, then it's likely LinkedIn will be best. Google AdWords requires a budget in excess of £300pcm - so MUST BE HANDLED CORRECTLY! Else you'll likely risk lose a lot of money. ...what to do at each above phase. Many forget business principles when it comes to creating Marketing Materials as it's too easy to get caught up in the vehicle or medium (eg.Flyer or Website). ... as an entrepreneur / business owner, there is always merit in 'getting started' and doing a 'good enough job' and 'will do for now', as many who don't get started don't make sales or are much slower at making sales. ... Just don't expect it to do much for you, or remember perhaps why you're frustrated in months or years to come. IMPORTANT: Make sure that 'at least' you're minimal effort here doesn't do you an injustice or detrimental to your prospects who check you out first. 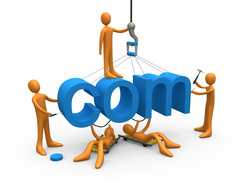 Ideally, don't think "How can I 'build' my website? What content shall I 'write'? ", instead think: "What business 'goals' am I hoping to achieve from this marketing piece?" (be it website or flyer etc), "What sales am I hoping it's going to help with?" "How many Sales or enquiries over what time?". Like most things in life, if you can't see where your aiming how can you get there? Start walking and hope for the best? or worse, waste lots of time or money belting really fast in the wrong direction? Once you know 'who' your website needs to attract, you'll be clearer on the appropriate 'web content' and even 'marketing vehicle' to 1.Please them and 2.Get you in front of them. and then converts (gets them to enquire or buy). Then you need to structure to organise your brilliant content into an intuitive easy to use way. your buyer or influencer will have 'easily' found the option suited to them! THE KEY: knowing which are right for you and how & when is the key. Your 'business offering' needs to be in front of 'Business Owners' and 'Influencers' who are 'ready to buy'. A Google Ad will get you to the top of Google same day, but consider longtail phrases/searches (4+keywords). e.g. Someone searching for "Swansea AdWords Web Consultant" is far more likely 'ready to buy' than someone searching for "Web Consultant" + it's easier to ranked for such as there'll be far less web competitors. 'IF' you're targeting businesses, then LinkedIn is the most likely (of all Social Media) to get you in front of the right buyer.